St. Lucia has officially announced that his next full band studio album will be titled Hyperion, and is scheduled to arrive on Sept. 21 via Columbia records. The New York-based songwriter/singer/guitarist/DJ announced the album’s upcoming arrival on Friday morning, in addition to sharing what will be the third track featured on Hyperion with a retro, 80s pop sounding dance tune titled “Walking Away.” The song can be heard in full in the audio-only music video above. “Walking Away” follows the previously released pair of singles, “A Brighter Love” and “Paradise Is Waiting,” which arrived just over a month ago back on June 22. “Walking Away” is a little more computer-y, if that makes sense. The track is fueled by 1980’s-styled synths and an intense vocal performance from the South African artist. 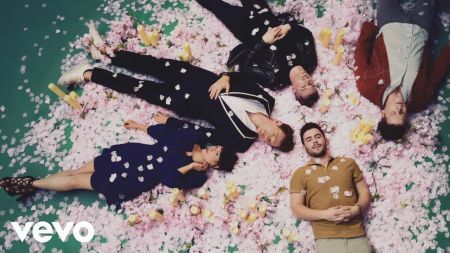 Overall, it’s another fantastic mix of modern synth-rock and dance music that has come to define the band’s sound since they emerged out of the New York City club scene throughout the earlier part of the 2010s. The upcoming release of Hyperion will be the band’s first studio album since 2016’s Matter, and the first big band project since St. Lucia (real name, Jean-Philip Grobler) and his bandmate/wife Patricia Beranek welcomed their first child back in December of last year. For the most adorable baby photos/video to go with their fun dance-styled rock music, fans should definitely check out Patricia’s Instagram page. The band is set to return for what will presumably be a big album campaign with a North American headlining tour set to begin with a pair of hometown shows in New York City on Sept. 21-22 and carrying on well into the fall months before coming to an end on Nov. 12 at Boston’s Royale. Tickets to select shows on their upcoming fall tour are on sale now and can be purchased by clicking here.